Bad Wolf Press has created a series of clever musical plays that teach basic concepts in an imaginative and fun-inspiring way. Not only is academic information delivered via the plays, but the cast members practice important social skills, such as camaraderie, public speaking, teamwork and cooperation. One example is the musical play “Character Matters”, wherein the (recovering) Wicked Witch and others, help in character-building issue — Cinderella with anger management, the Big Bad Wolf learns the Golden Rule, etc. Because the scripts are not preachy, audience students pay attention to them and acting students can enjoy playing the roles. CD with rehearsal music and performance music – On the recording you’ll first hear our singers demonstrate all the songs, then just the musical accompaniments to each song so you can hear and perform the shows. You don’t have to sing or play a note! Bad Wolf also offers licensing packages that make it affordable to bring a performing arts curriculum to a grade level or entire school. Because what we learn in enjoyment lasts for many years, Bad Wolf’s approach to communicating a variety of ideas and facts in an enjoyable way, makes it very effective and powerful. 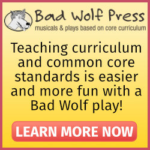 Since 1995, over 150,000 Bad Wolf classroom productions have been staged, world-wide, proving it is a powerful resource for homeschool support groups and others. Visit the website for complete information. E.S.